Left: Vincent van Gogh, The Road Menders, 1889. Oil on canvas, 29 x 36 1/2 in. The Phillips Collection, Washington, DC. Acquired 1949. 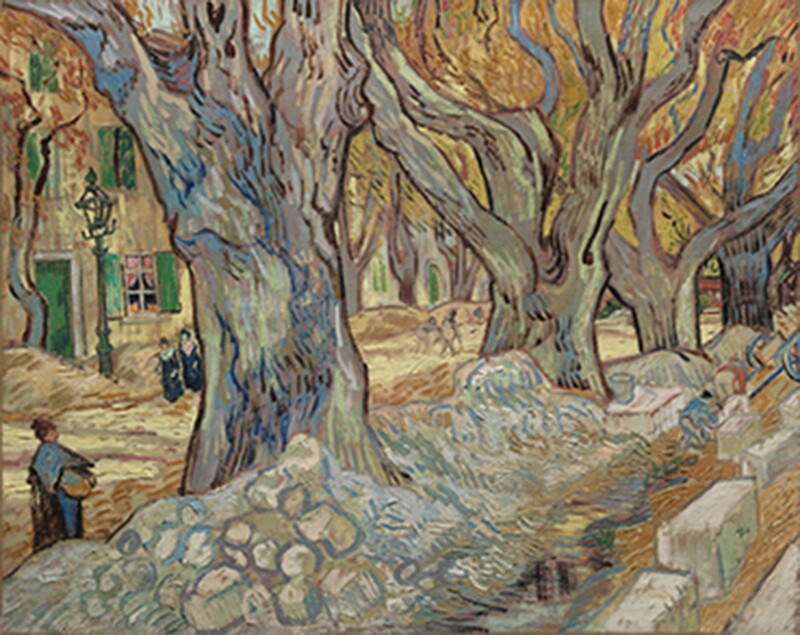 Right: Vincent van Gogh, The Large Plane Trees (Road Menders at Saint-Rémy), 1889. Oil on fabric, 28 7/8 x 36 1/8 in. The Cleveland Museum of Art. Gift of the Hanna Fund, 1947. Van Gogh stated in a letter to his brother Theo that when working from nature “one catches the true and the essential.” He painted The Large Plane Trees outdoors during his stay at a mental institution in Saint-Remy. He observed a row of plane trees (closely related to the American sycamore) during a trip into the nearby village, and quickly painted them to capture the changing autumnal colors. The repetition, The Road Menders, was completed later, in the studio. Van Gogh emphasized different elements in the two works. Their titles indicate some of the differences. Why do you think each painting has the name it has? As you observe the two works, what similarities do you notice? What differences? What might the variations in style tell you about van Gogh’s process of working from nature versus working in the studio? The bright leaves inspired him so much that he quickly captured the moment on a piece of cloth, resulting in The Large Plane Trees. How would the leaves on the trees look different if he had waited a few more weeks to paint this picture? How would the colors be different? How might the composition look different? Would the mood have changed?